The ideal choice for someone who wants a whiter smile with the minimum of fuss is in-surgery laser whitening. Within as little as 90 minutes, a whiter brighter smile can be achieved. At Egham Dental Care, we use the class leading Phillips Zoom! Whitespeed system. 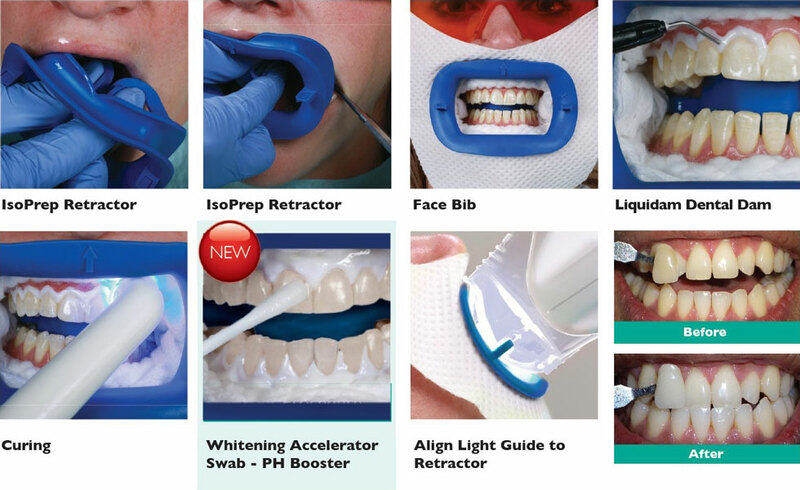 This a a safe and predictable method of whitening. Priti Patel (practice manager and Dr. Patel`s wife) has had this method of whitening performed. This is, in our opinion, a testament to our trust in the safety and efficiency of the system. She is happy to discuss her experiences, as well as showing the results to you. With so many whitening options out there, it can be a challenge to separate the fact from the fiction. We’ve rounded up some commonly asked questions to help make your choice clearer. The most common concern is temporary teeth sensitivity, but lots of advances have been made in recent years to help combat this. Philips Zoom! WhiteSpeed has adjustable intensity settings to help maximise patient comfort, and 99% of patients experienced little to no sensitivity. And Philips Zoom! DayWhite and NiteWhite have a special formula with built-in potassium nitrate and ACP (amorphous calcium phosphate), which are known desensitisers. These special ingredients make your enamel smoother and more lustrous as well. We also recommend that you brush with a sensitivity formula toothpaste like Fluoridex Daily Defense Sensitivity Relief two weeks prior to whitening, and that you take ibuprofen on the day of your treatment. What are the possible side effects of in surgery laser whitening? The most common side effect is tooth and gum sensitivity. Your dentist is your best resource to ensure that you are a good candidate for whitening and that you are using the right concentration of whitening formula. Philips Zoom! at-home whitening products have two mild desensitising agents, potassium nitrate and Amorphous Calcium Phosphate (ACP), to minimise tooth sensitivity. While results vary from person to person, your smile will be noticeably whiter with Philips Zoom!. With Philips Zoom! WhiteSpeed, you can get up to eight shades whiter teeth in one 45-minute office visit. Philips Zoom! DayWhite and NiteWhite offer a dramatically whiter smile in one to two weeks. And, unlike over-the-counter options, your dentist will work hand in hand with you until you’re completely satisfied with your results. That’s all dependent on your genetics and habits, but generally around 3-4 years. Drinking staining foods or beverages and smoking can limit your results, but you can easily keep your smile shining between treatments with the Zoom! Whitening Pen. And brushing with a whitening toothbrush like Philips Sonicare DiamondClean can also help maintain your results.